Описание: Проигрыватель сохраненных данных (back-up) с Voyage Data Recorder(VDR), так называемого "черного ящика" регистратора данных рейса для судовой индустрии. Регистратор данных рейса судна РДР-У является судовой системой регистрации параметров движения судна. Он предназначен для накопления и сохранения информации, касающейся местоположения, движения, физического состояния, окружающей обстановки и команд управления судном. Эта информация используется при проведении расследования с целью определения причин инцидента. 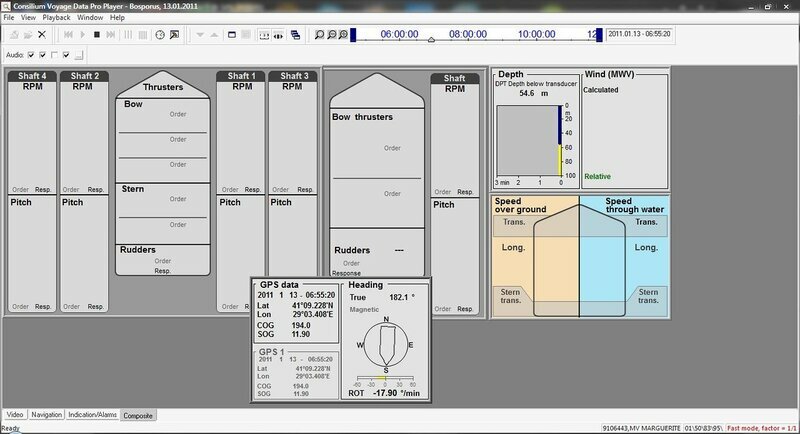 Voyage Data Recorder, or VDR, is a data recording system designed for all vessels required to comply with the IMO's International Convention SOLAS Requirements (IMO Res.A.861(20)) in order to collect data from various sensors on board the vessel. It then digitizes, compresses and stores this information in an externally mounted protective storage unit. The protective storage unit is a tamper-proof unit designed to withstand the extreme shock, impact, pressure and heat, which could be associated with a marine incident (fire, explosion, collision, sinking, etc). The protective storage unit may be in a retrievable fixed unit or free float unit (or combined with EPIRB) when the ship sunk in marine incident. The last 12 hours of stored data in the protected unit can be recovered and replayed by the authorities or ship owners for incident investigation. Beside the protective storage unit, the VDR system may consist of recording control unit and data acquisition unit, which connected to various equipment and sensors on board a ship. Although the primary purpose of the VDR is for accident investigation after the fact, there can be other uses of recorded data for preventive maintenance, performance efficiency monitoring, heavy weather damage analysis, accident avoidance and training purpose to improve safety and reduce running cost. Position, Date, Time using GPS. Speed log - Speed through water or speed over ground. 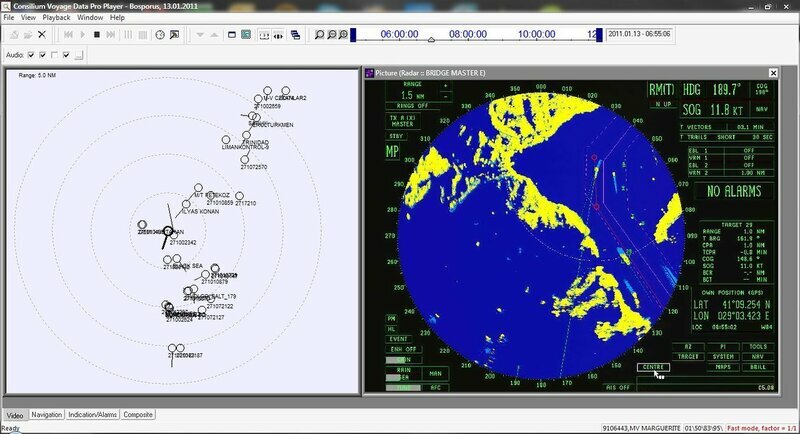 Radar* - As displayed or AIS data if no off-the-shelf converter available for the Radar video. Audio from the bridge, including bridge wings. Echo sounder* - Depth under keel. Main alarms* - All IMO mandatory alarms. Hull openings* - Status of hull doors as indicated on the bridge. Watertight & fire doors* status as indicated on the bridge. Hull stress* - Accelerations and hull stresses. Rudder* - Order and feedback response. Engine/Propeller* - Order and feedback response. Thrusters* - Status, direction, amount of thrust % or RPM. Data marked with * may not be recorded in S-VDR, except Radar and Echo Sounder if data & standard interfaces available.